Nazareth House Apostolate has taken some hard hits, recently, including Gladys, whom we tried so hard to provide medical help but died after surgery; Nancy Denison, one of our greatest supporters; Alimamy, the medical man who provided so much help all around him in Sierra Leone; the deaths during the floods of Kroo Bay; Salu & Kadiatu's baby (who was prevented life because a c-section was not offered)... and now there is the loss of Pa Amadu Barrie and most recently Fr. Bob Haux. All of these events hit hard in the heart. We must, in the honor of all of our friends that have went on before us, push harder than ever to make their dreams, our dreams, a reality. This begins with raising the money to purchase the compound. Without a permanent residency we cannot continue. It is the logical, practical and necessary step as we further our work with the poorest of the poor. Rental property is never secure, as we well know. We fix a place up, pay rent a year ahead and are still asked to leave. We have been given notice to vacate the small house we rent now by March 1, 2009. We must have a center of operations that we know is legally ours, one that we hold title in which we cannot be removed. Scrolling down to past posts of this blog, you will find one such opportunity that we might purchase for a compound. The purchase price $250,000. How do we raise this kind of money? By spreading the word of this work. By asking everyone to give to this worthy cause. By fund raising projects, baked sales, selling hot-dogs outside of Walmart, groups of people working together and individually for one common goal. If one thousand people each gave $250 we'd have this compound purchased. This Christmas, in the midst of the hustle and bustle to buy Christmas presents for your friends who "have everything"; think about a gift that will provide sustenance, education and LIFE to someone in Sierra Leone through Nazareth House. When you do, A gift card will be sent to your friend informing them of your generous donation in their name. Make a difference this Christmas, a real difference in the life of someone who would literally have nothing without you. One thing that Nazareth House takes very seriously is that we go over and beyond to make sure that every penny is used for the purpose in which it is collected...the purpose being, benefitting those in need in Sierra Leone. In an effort to do this we document what is given and how it is received in photos, etc. When I started getting the phone calls from St. Laurence House when Fr. Bob passed on, I was surprised by the depth of grief they were experiencing for a man they never met, physically. However, as more and more calls, our school closed down, and the signs started showing up in email photos, I realized the impact that each of us make on the lives of those in Sierra Leone. 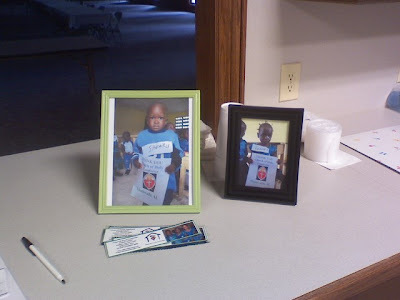 I label each item that I send to Sierra Leone with a note of who the donor is. What I mean is, if you or your group send several boxes of tylenol to me, I put your name on it and send it on to James to distribute. Each financial donation, as I wire it, I inform James who it is from and what that donation's purpose is. If it is for a bag of rice, then James knows that a bag of rice is from you and as he distributes it, he tells the recipient who gave it to them...by name. I started this form of record keeping as a documenting gesture, so that I could account and know exactly where every donation and penny went. What I hadn't considered is the impact that this documentation has on the recipient. They have just been handed either food, medication or assistance from a specific person or persons. They KNOW that this person from America or wherever has just in some way improved their life. 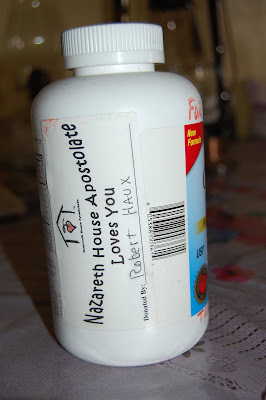 And so it was with Father Bob... all over Freetown and Kabala, people had a gift from him.... an item that improved their life and it was labeled "Nazareth House Apostolate loves you, donated from: Fr. Bob Haux". It gives them the opportunity to know a name, a real person and for them to know that you love them and care about their existence and want to help them. When the kids hold up the signs that say thank you to a specific person or organization, we like to look at the photos and see our names but those holding the signs like to see, from that sign, that a real person with a name is caring about them. This makes us, all of us that wear the name of Nazareth House Apostolate of which you are included, a unique group giving personalized assistance and making personal friendships to all we serve. Awesome. Now, in answer to the tons of emails and questions about Fr. Bob's send off. Yes, of course, his funeral was beautiful and as he would have wanted. Afterwards we toasted his life and celebrated his love. We will always miss him, We will always love him, We will smile, cry, and continue doing this thing called life until our paths meet again.